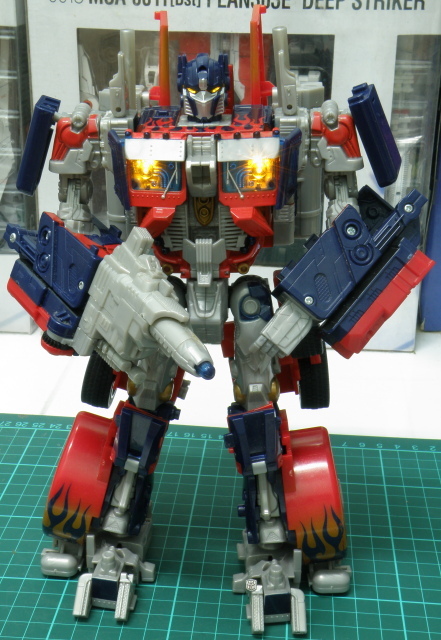 Transformers Movie 2007 Leader Class Optimus Prime Robot Mode [Part2] | Out of the box. Optimus Prime, defacto soul of transformers. Make no mistake that no bot will ever replace this character. 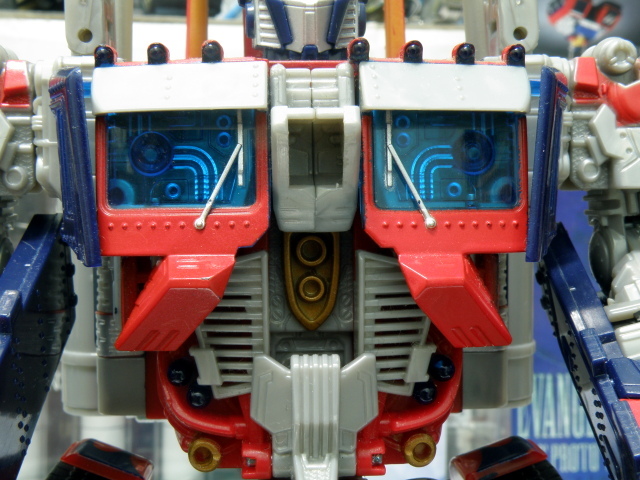 Even in the movie, Optimus Prime is designed to look closer to it roots or face the warth of its fans. 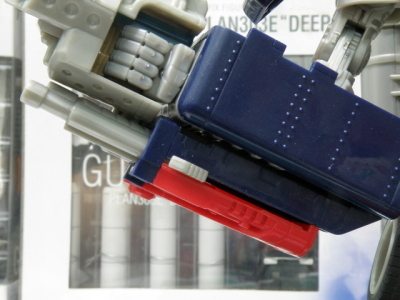 The leader class Optimus Prime toy comes in the default mode of a robot. 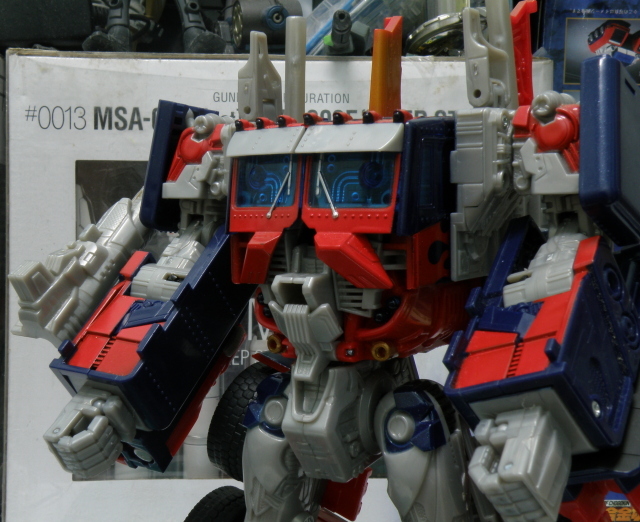 From the first glance it do not really look like the Prime you see from the movie. Disappointed ? Nope disappointed is not a good way to describe this Prime. Despite the lack of aesthetics Leader Class Optimus Prime from the Transformers Movie 2007 is more than meets the eye. The reason is it is having great if not excellent details and it articulations is good if it is not great. Another is its transformation gimmick of this toyline is the feature known as AutoMorph™ , where the part transform itself with a flick or touch on a switch or button. With a flick on the switch jut below its abdoment, the AutoMorph™ will pop out Optimus Prime head with lights and sound. Too bad there is only 1 sound in this mode. This toy does not disappoints in the detailing department. The design team took the pain to add feature at the underside of the plastics. The detailing are so good that even the rivet/bolts are molded onto the plastic, giving it a tough industrial look. Wiring details are moulded as well as panel lines. A good example to highlight on the detailing on hidden part is its shoulder pads. It is hold by a ball joint, once it is lift up, panel line and circuit detailing can be seen. To make it sweeter, the articulation of the shoulder pad is not too tight or loose, it is just nice. 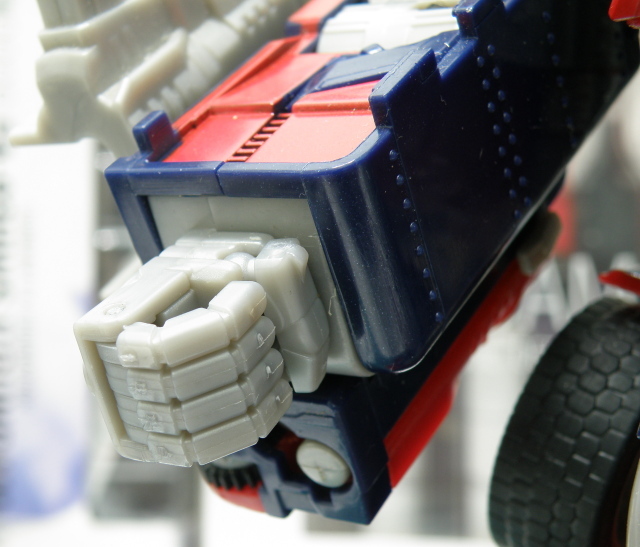 Further down the robot torso, its pelvic region is given good detailing too. 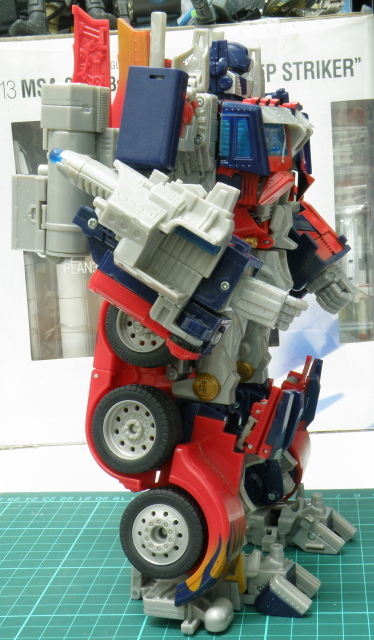 Unfortunately, Optimus Prime lack of articulation at the waist region to do a good twist. But still the detailing done is nice. Another good example to highlight is its head detailing, though the paint job is not good. It comes to a quick relieve to know that Hasbro did not add Optimus Prime pie hole in this toy. The Optimus Prime with mouth in the movie is real freaky. 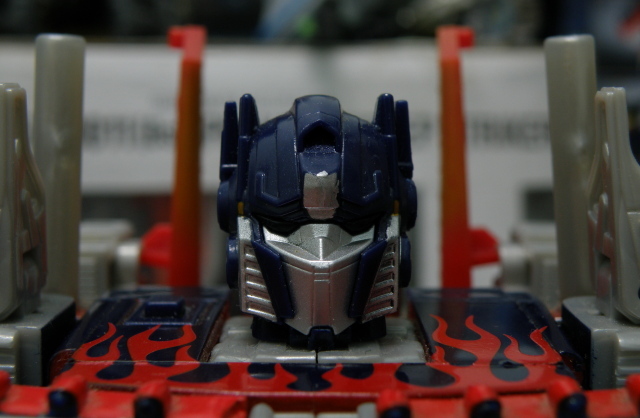 Optimus Prime head from the side. The robot head if look at the side is abit of a disappointment, for it has an ugly splitting and gapping seam run vertically from Optimus Prime head. In a more gruesome way of describing it, it is like Optimus Prime is getting ready to be lobotomized. Since it is a toy not intended for premium collector segment, it is understandable. However, at a closer look at its head during the AutoMorph™ operation, it looks cool. Unfortunately, the paint job malfunction on its forehead is abit of a turn off. 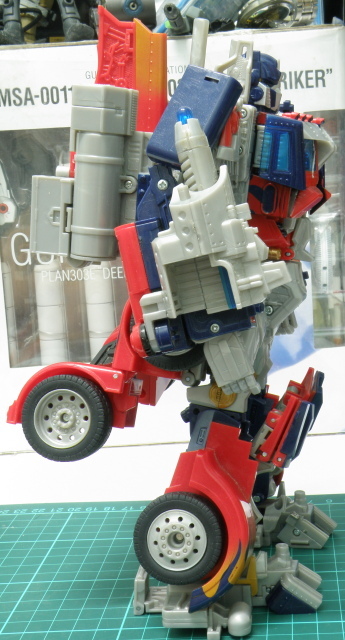 From an overall look at the Optimus Prime, looks like he is carring a very heavy back pack, with very large top, small head, large lower legs and feets with Popeye™ ´s arm. Though the Popeye™ ś arms can be easily overlook with its articulated fingers. Too bad the hands does not twist at the wrist. The articulation is not including the finger tips and individual segment though. But it is good enough for the toy of this class. 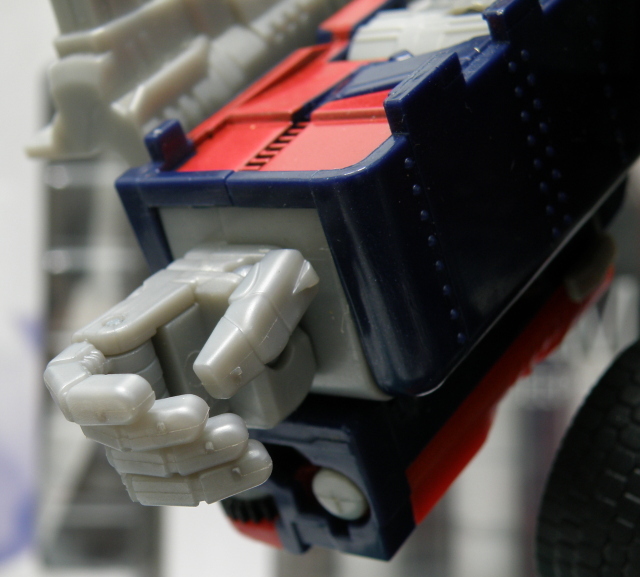 Optimus Prime robot fist opened. Each of the fingers on both hands are articulated individually. 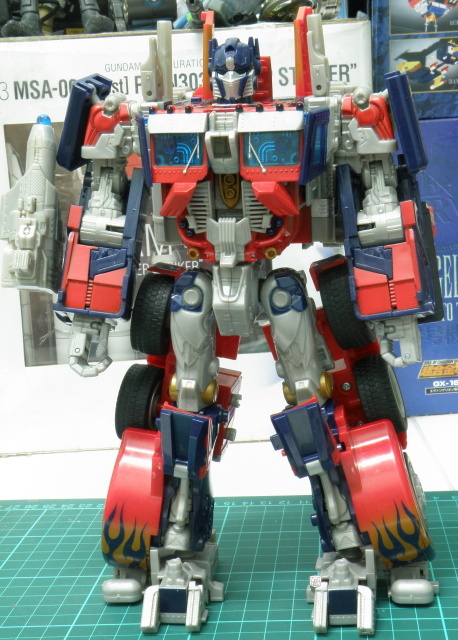 From all side the overall view of Optimus Prime robot just looks fine. Optimus Prime robot left side. 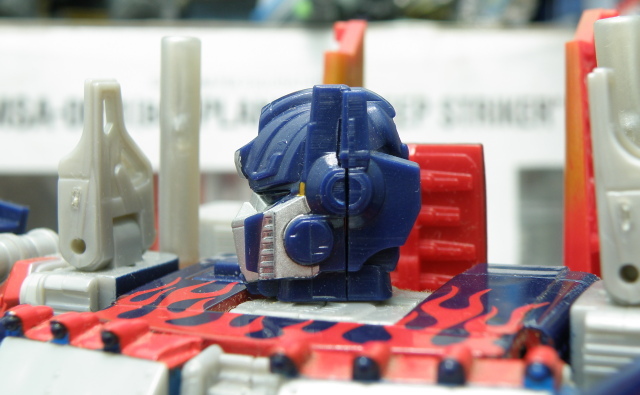 Optimus Prime left side is mode soft and plain. It is due to all action is placed to the right. Yes, the big gun is embeded to the right hand. The wheels at the back of the robot tight can be adjusted to allow better knee articulation to the back. 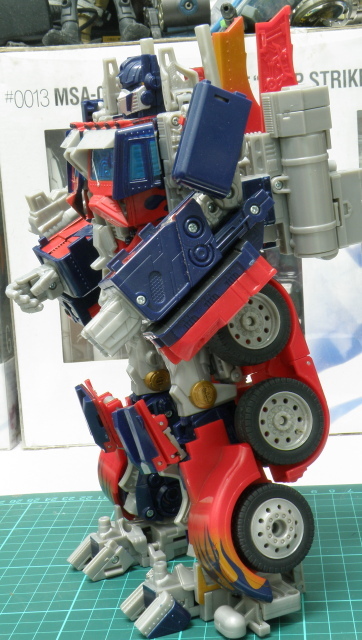 Optimus Prime robot leg wheel up. But it does not help much too, for the wheels at the heels will touch the wheel which is adjusted when the knee joint is hit less than 30 degrees. 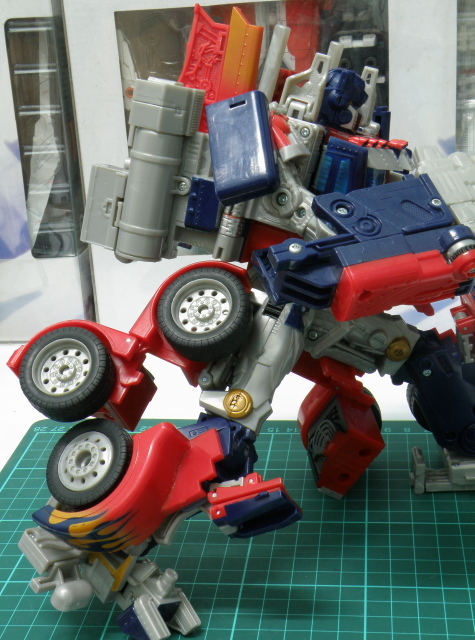 Optimus Prime knee bending limits. It is a shame that due to the wheels the knees unable to fulfil its full potential of 90 degrees. 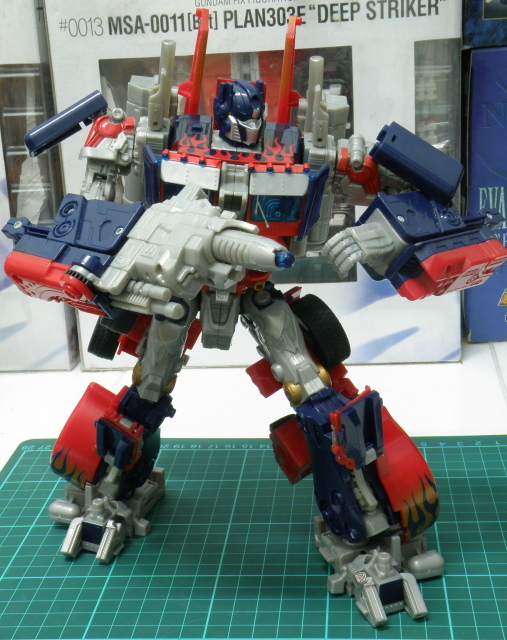 The gimmick of Optimus Prime other than the AutoMorph™ is its gun embeded on the right arm. Which need to have the lever at the inner right side of the arm to be slided. 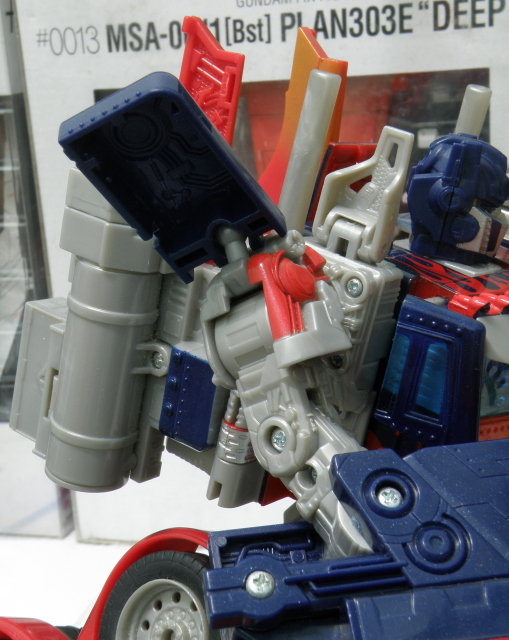 Optimus Prime Gun activation lever. With the gun activated, the articulation of Optimus Prime is as good as it is having its gun kept and it improves the possability of the right shoulder pads. 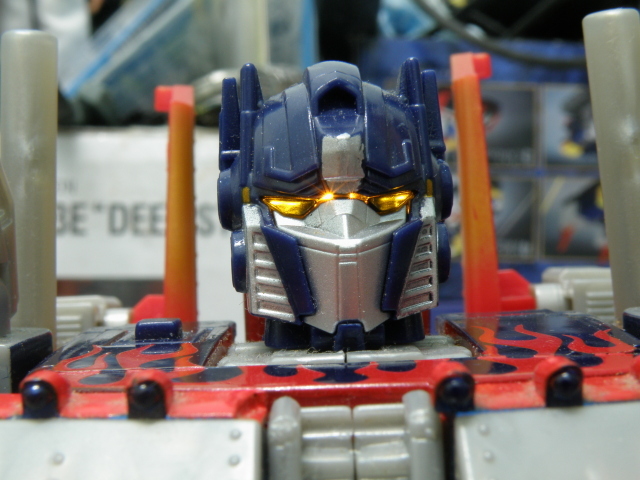 Optimus Prime front view, at ease. 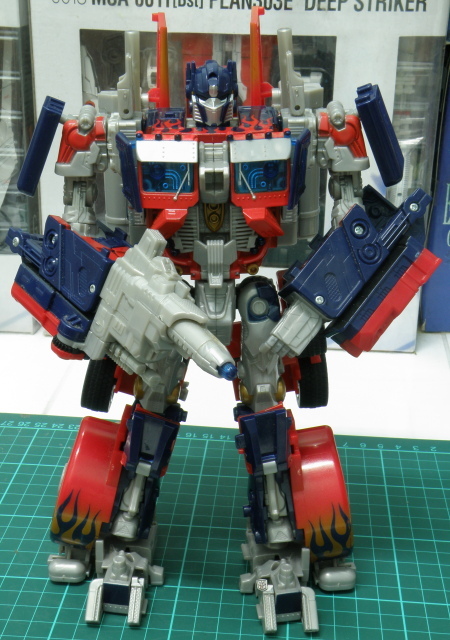 Optimus Prime robot pose aiming gun. Action pose can be made more dramatic, but the limitation articulation on the wrist and waist; topping on the limited movement of the ankle due to the mud guard also the back wheels; has severely hindered the articulation of this robot from performing more radical articulation. 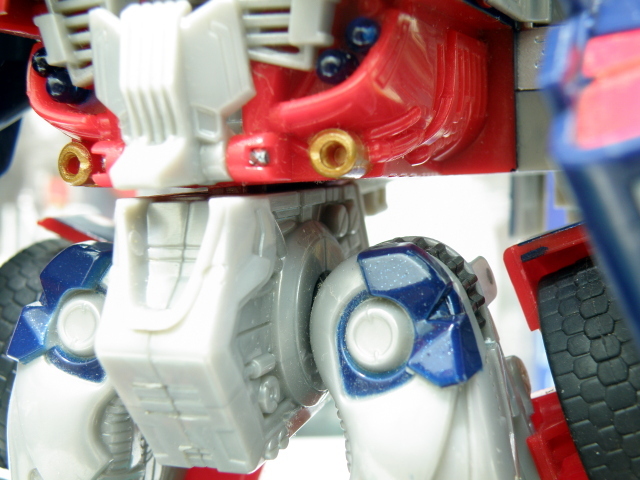 On the nut shell, leader class Optimus Prime is a great toy with superb detailing and good possibility. If it is more articulated, it would be really a great toy. Gimmicks is very minimal, with AutoMorph™ featured is being given more attention to it. 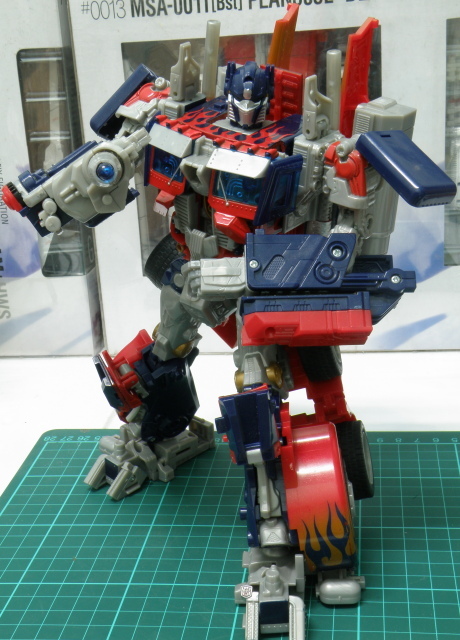 I am looking forward to the Revenge of the Fallen leader class Optimus Prime in the near future. 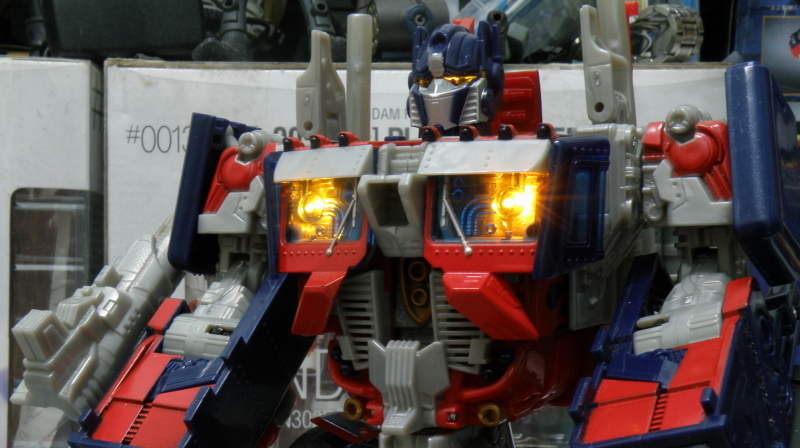 Optimus Prime front view, at ease lights activated. Optimus Prime aiming gun at you. This entry was posted in Mecha, My Hobbies, Transformers and tagged armament, articulation, autobot, convoy, cybertron, gimmick, hasbro, hasbro transformers, leader class, optimus, optimus prime, review, robot, robot mode, takara, takara tomy, takaratomy, Transformers, transformers movie 2007 by KarMeng. Bookmark the permalink.